Home Medical Entrance Exams Gujarat MBBS Admission 2018 – Last Day To Register Today !! Gujarat MBBS Admission 2018 – Last Day To Register Today !! 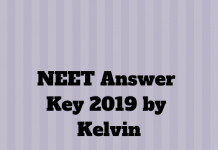 The aspirants who are seeking admission to MBBS programme in the Government and Private institution of Gujarat, they must appear in the NEET UG 2018 Exam. Not only this, the NEET qualified applicants also have to register and apply to participate in the counselling process for admission into MBBS programme. This article will guide the aspirants on how to apply for Gujarat MBBS Admission for the academic session 2018. The application form for Gujarat MBBS Admission 2018 has been released on 13th June 2018 and will be available until 19th June 2018. Link to register is provided below. The applicants must check the eligibility criteria before going to apply for the counselling. The candidates can access the application form online by visiting the official website. The last date to register and fill up the application form is 19th June 2018. The first and foremost process is get registered. Follow the below-given steps to register. NOTE: After entering the above details and clicking on “submit” button, a login ID and password will be sent to the registered Email-ID. After submitting all the details, the last thing the candidate needs to do is to pay the application fee. The application fee must be paid online via debit card/ credit card or net banking. After the fee submission, applicants are advised to download and take the printout of the filled application form. The printout of application form is required to submit/ produce at the time of reporting for document verification. Applicants are instructed to perform all the above-mentioned steps carefully while filling up the application form. Details once submitted cannot be changed or edited later. So by following the above steps, candidates can apply for Gujarat MBBS Admission 2018. If any query or doubt arises while reading this article, please write us in the comment box. Previous articleWest Bengal MBBS Admission 2018 – Registration Started! !